U.S. Disaster Relief teams are in Hawaii cleaning out flooded homes in Jesus' Name. UPDATE (May 14 and May 17): Samaritan’s Purse is also now supporting relief efforts on the Big Island (Hawaii) in light of recent volcanic eruptions. We are distributing thousands of half mask respirators that filter both particulates and sulfur dioxide gas. Residents have already expressed their relief and thanks upon receiving these items. In addition, Billy Graham Rapid Response Team chaplains are ministering to the displaced. Rayven Hockett stands on her porch, overlooking the marsh which was a raging river during the storm. The tropical island of Kauai normally receives plenty of rainfall. But the mid-April storm that swept through the North Shore was unlike anything residents had ever experienced. Up to 50 inches of rain fell in 24 hours, causing flash flooding and dangerous mudslides in the mountains. The main highway, which provides the only access to several beach communities, was rendered impassable due to mud and washouts. Hundreds of residents were cut off from the rest of this island. Like many residents of Hawaii, Rayven Hockett is no stranger to wet weather and even flooding, but this storm was different. Thunder and lightning, a rarity on the island, rocked the town of Hanalei as rain poured down. Overcome by the force of the storm, Rayven prayed for safety and watched as her backyard turned into a raging river. It was too late to evacuate so she retreated upstairs and hoped that her house would be able to withstand it. Finally the storm calmed and daylight broke. Rayven went downstairs to see the damage and found her favorite room—her art studio—in complete disarray. She was heartbroken. Boxes of jewelry-making supplies floated and spilled out in the water. Tools were covered in mud, and standing water filled the room. The studio, which used to be her place of refuge, was now a visual representation of the disaster she was facing. More than 50 inches of rain in 24 hours left a muddy mess in Kauai, Hawaii. Samaritan's Purse is busy on the island of Kauai helping homeowners hit by terrible flooding. Samaritan's Purse volunteers are clearing and cleaning homes on Kauai. Flooded homes on Kauai often needed the walls torn out. Floods caused by record rainfall damaged homes and downed trees. Samaritan's Purse volunteers take a break toward the end of a long day. Rayven Hockett says her art studio, where she fires glass to make beads for jewelry, is her refuge. It was severely damaged by the storm. Our volunteers cleaned out her home and protected it against mold growth. Volunteers are hard at work to serve homeowners in Jesus' Name. Billy Graham Rapid Response Team chaplains met with homeowners on Kauai. After each job is completed, our volunteers present homeowners with a Bible signed by volunteers. Prayer is an important part of each Samaritan's Purse Disaster Relief response. Homeowner Libby Beck thanks Samaritan’s Purse volunteers for their hard work on her home. Little by little, Rayven’s hope began to be restored. Family members flew in from the mainland to organize her art studio, and a church member repaired her car. A mold test confirmed her fears, however, and revealed there was even more work to do. Her walls needed to be torn out and home sprayed with mold suppressant. She was disheartened, but God again proved faithful. A team of Samaritan’s Purse volunteers was on site and eager to help. About 30 minutes from Rayven’s home in Hanalei lies the town of Wainiha. In the first two weeks after the storm, the small coastal community was only accessible by water or air, due to landslides and washouts. Kauai immediately rallied together to help Wainiha: boating in food, water, medical supplies, and other necessities while evacuating those who needed medical attention. Megan Wong, who grew up on the island, quickly began organizing the logistics—identifying needs and coordinating ways to meet them. Volunteers are busy clearing debris and treating homes for mold in Kauai. Nevertheless, they felt overwhelmed by the number of needs and lack of resources. It was at this time that U.S. Congresswoman Tulsi Gabbard informed Samaritan’s Purse President Franklin Graham of the situation. He quickly traveled to Hawaii on April 26 to see it firsthand and determine how we could help. Not even a week later, on May 2, Samaritan’s Purse airlifted tons of chainsaws, tarp, mud-out kits, and cleanup supplies on its DC-8 cargo plane. 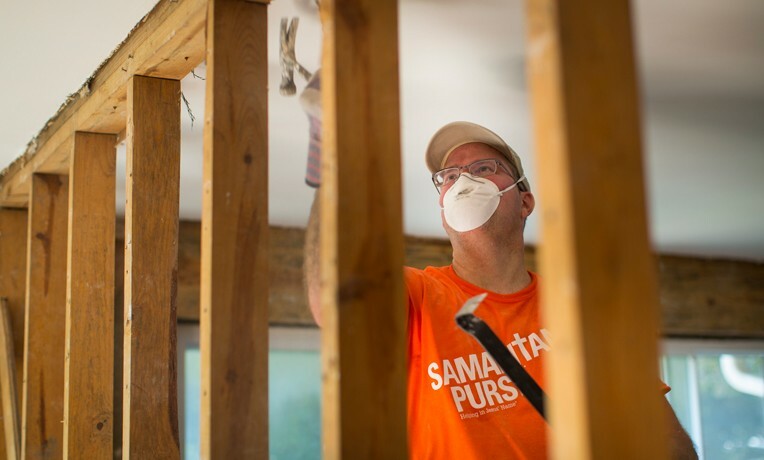 Samaritan’s Purse is linking arms with the local community—committing to not only help them with immediate disaster relief but to also repair homes and support families as they begin to recover. Johanna Ventura is one Wainiha homeowner benefitting from the work of Samaritan’s Purse. She describes her house as being built on an island between two rivers. Although she knew it was a flood zone, she never expected the water to rise so high. Wainiha, which translates to “angry water,” lived up to its name that night. Johanna was shocked to find out that an organization from North Carolina cared enough about Hawaii to not only show up, but also to airlift supplies and disaster response specialists from the mainland to help her. Next, Samaritan’s Purse will assist Johanna with permanent repairs by reinstalling drywall and repairing her roof. Billy Graham Rapid Response Team chaplains work alongside Samaritan’s Purse volunteers on Kauai. Please pray for Samaritan’s Purse volunteers as they strive to be the hands and feet of Jesus. Together with the local church, Samaritan’s Purse wants to provide physical relief while sharing the hope of the Gospel with families who are hurting.